Video Reviews of Gatorback B240 Professional Electricians Tool Belt Combo. Various Sizes. 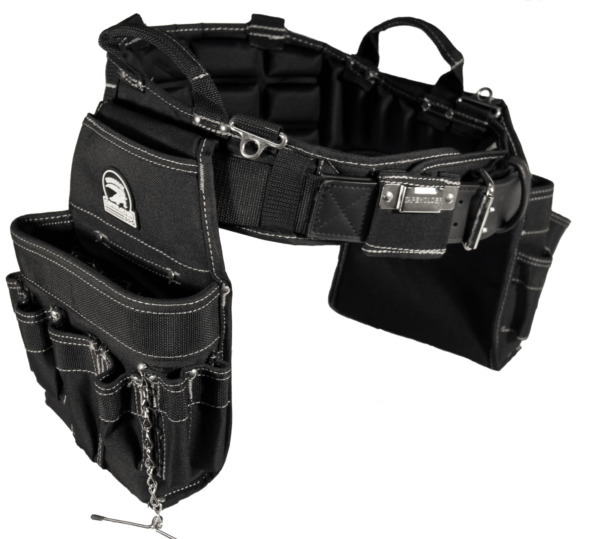 ↵GATORBACK: This is our top of the line Gatorback tool belt coming straight from the manufacturer! COME FEEL the DIFFERENCE of the MOST COMFORTABLE TOOL BELT MADE. Inspired by a Gator's Back this tool belt offers incredible Comfort, Support and Ventilation. This tool belt features our unique ventilated padding to help you sweat less and with our memory foam padding it makes it breathe better and give you the most comfortable belt. The carry handles for easy transport and putting the belt on and taking it off. Plus each pouch was engineered to carry the tools of a professional electrician. And you don't need to worry about toughness because these belts are guaranteed tough with the reinforced box design with an inner hard plastic lining as well as rivets and bar-tacking at every stress point on the belt. All of Contractor Pro's Gatorback products are Guaranteed Tough and Always Comfortable! Get all the gear and save some money while you're at it! Check out our Ultimate Electrician's Package and add some gloves, suspenders and a drill holster to your belt all in a single package deal! Make it a full set! FREE Shipping and 1 day handling on ALL our products! $25+ orders get free Expedited Shipping!